I have been studying at Regent’s University London for about a week now, and I’ve noticed that a lot of structures surrounding Regent’s Park have some sort of monogram on them that looks like this. A typical lamp post outside Regent’s Park. I figured it had something to do with the Queen since it has a golden “E,” but I wasn’t sure about its purpose. I’ve seen this marking on everything from lamp posts to “rubbish” bins, and I just couldn’t understand why. That is, until Sunday, when our perky tour guide Simon started calling out random trivia during our coach ride home from Stonehenge (Thanks Simon). The monogram is actually a royal cypher that symbolizes what monarch was reigning when the marked item was installed. 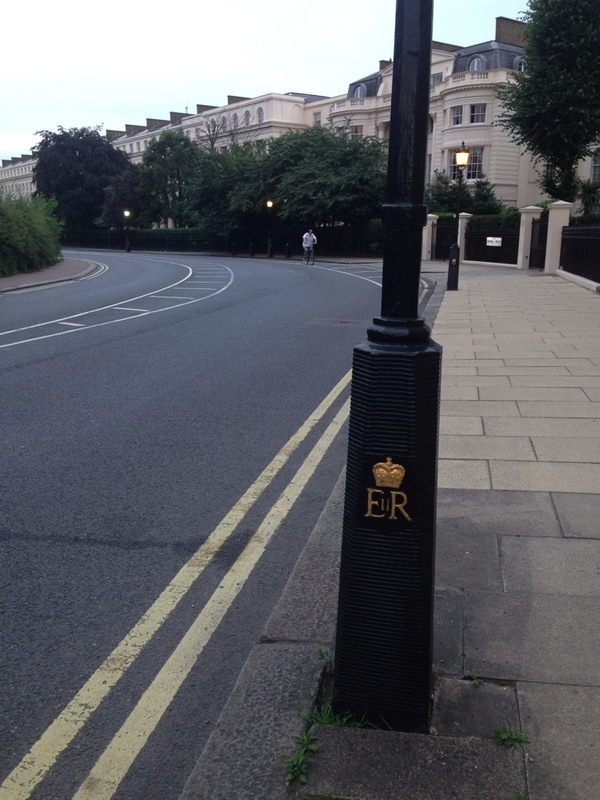 That means the lamp posts around Regent’s were put into place sometime since Elizabeth II took the throne. I saw another pole somewhere in London with a “VI” between a “G” and a “R,” which means it is even older than the lamp posts since it was installed under George VI. The first letter denotes the first name and the R stands for “Rex” or “Regina,” which is Latin for “king” and queen,” respectively. It’s amazing how much use you can still get out of a dead language. You can supposedly find things with Victoria’s cypher on them, which means I will probably start scanning the streets looking for a golden “V” rather than look the right way before crossing the street. I’m still not quite sure why you need a cypher on a garbage can in the first place, though it does look classy. I’m impressed that you figured this out. It is an interesting way to date the city’s infrastructure.